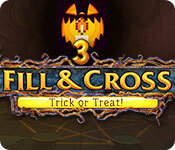 Fill and Cross: Trick or Treat! 3 is rated 2.4 out of 5 by 5. Rated 5 out of 5 by LanaPook from Griddle your brain. I like this game. It makes me slow down and really plan my next move. I understand that others prefer the more colorful games and I like them too. However, I like the challenge this game offers and find it fun. So if you like this type of game give it a try. Rated 2 out of 5 by annieliz1 from Not much of a game Mosaics are not my first choice of game but I do like to do one from time to time. To be truthful, I don't really like the ones with lots of colours; I just like to do the counting and fill in the gaps, hopefully correctly. So I gave this one a go despite poor reviews. Eventually I had to pinch myself to check I was still awake/alive. When the demo time ended it was a bit of a relief. Even doing the maths seemed like a chore and there were no redeeming features. Rated 2 out of 5 by Draclvr from More of the same... Don't waste your time with this one. Same music, same sound effects, same graphics... you get the picture. 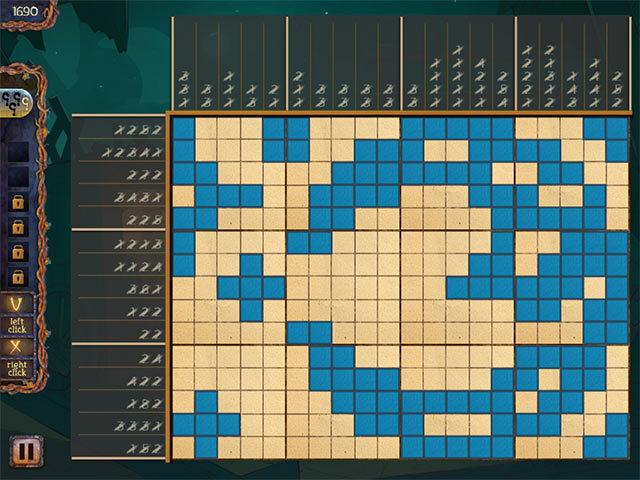 And the inane "clues" at the beginning of each puzzle? Really? Even the little bit of added fun and value of the 15 trophies advertised with the game would have helped. But they are nowhere to be found. I would call this one a lazy recycled version of previous versions from this dev. Rated 2 out of 5 by pennmom36 from I WANTED A TREAT BUT I GOT TRICKED WITH THIS GRIDDLER INSTEAD Here's a griddler riddle: What's blue and white, blue and white, blue and white? Answer: This game all crumpled up inside a trash bin where BF must have found it. Sorry BF but this game is worthless. This review may sound like a broken record because it's probably exactly the same as the last 2, not to mention the fact that this is the same exact game with the same exact features as all the other holiday griddlers this dev offers, surely this game isn't flying off the shelves so why do they keep making them? There are 6 Rooms with 12 griddler puzzles in each, and you need to earn enough stars to unlock each room. You will earn up to 3 stars per puzzle, a star is deducted for each mistake you make. 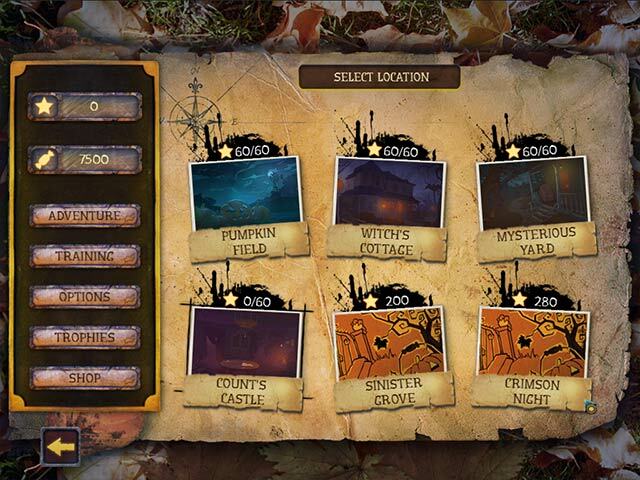 You can purchase more starting hints, the right to make 3 mistakes or refill hints on the current level, in the shop. This is a Griddler Mosaic game with a Halloween theme. The point of the game is to fill in or cross off boxes on a grid using logic (no math involved other than counting) Each column and each row has a set of numbers that indicate how many cells need to be filled, each set of numbers must be separated by at least one empty or crossed off cell. Sometimes it's easier to figure out which cells can't possibly be filled in but there is a tutorial for Beginners (7 training levels) and a refresher level for Experts. Don't be intimidated by this type of game, they are really easier than they look, and really fun, but this game is a poor example. 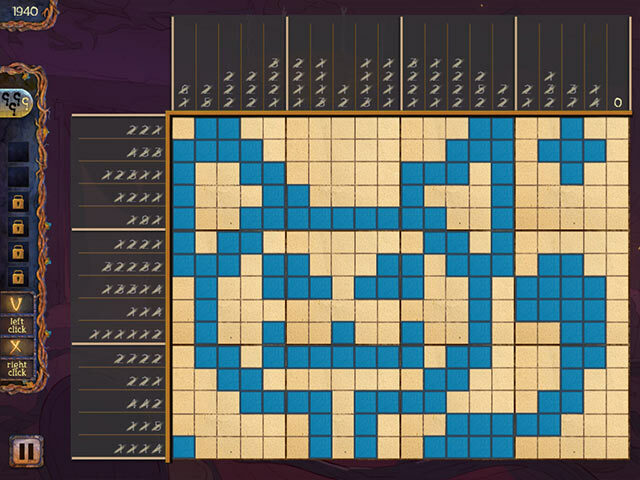 In some of the better Griddler games such as the Rainbow series and Fantasy Mosaics you get to solve grids that have several different colors and the pictures actually look like something when finished so skip this dud and try one of those. Rated 1 out of 5 by skywatcher33 from Griddler fans, don't bother Really, Big Fish? Did you even look at this game before offering it? A huge disappointment for a griddler fan such as myself. Seems to be from the last century as to graphics and, well, everything. Doesn't begin to compare to the penguin series or the world mosaics. Very boring with no colors, no story, no fun. The coins you earn can only be used to get more clues, which you don't even need anyway. Maybe would have even been tolerable if I could have bought Halloween decorations or something.Wasted 12 minutes of my life on it, too. I never write reviews, but felt I needed to warn others who did the happy dance when I saw it offered today.